This article is from The Atlanta Jewish Times. To read the full article, click here. Middle East politics are roiling the Emory University campus after fake “eviction notice” flyers were placed on doors of dorms and off-campus apartments as part of an annual pro-Palestinian student protest. According to various sources, the flyers were posted on the dorm doors of Jewish and non-Jewish students. Flyers also were posted at the off-campus Emory Point apartments. The flyers, which appeared on April 2, had been approved by a university office, Emory Residence Life, which later ordered them removed because they violated a policy against posting flyers on the doors without student consent. A university spokeswoman said that multiple departments within the school continued to investigate the incident. An estimated 17 percent of Emory’s undergraduate students and 10 percent of its graduate students are Jewish, according to the Hillel International website. “In reviewing this incident, we found no evidence that individual students or a particular group were targeted,” the university said in a statement issued April 3. 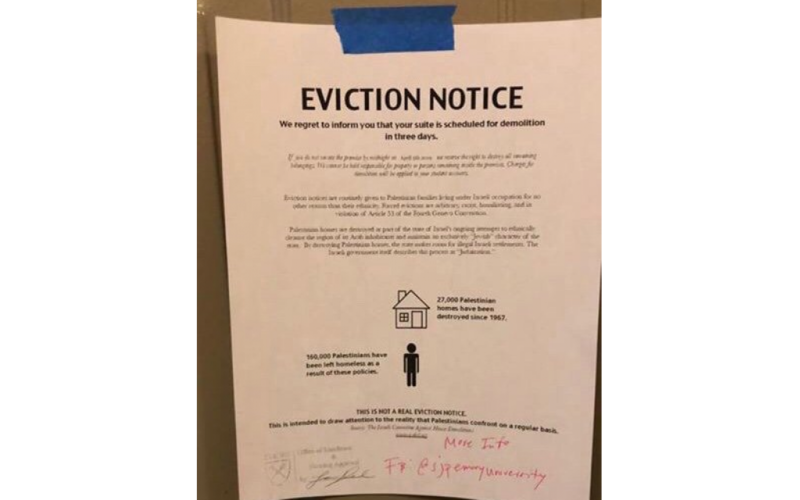 Screenshot from twitter of mock eviction notice posted on Emory students’ dorm room doors. A disclaimer at the bottom of the flyer advised that the warning was not real. Similar flyers have been posted on dorm doors of other campuses in recent years. Dave Cohn, director of Emory Hillel, issued a letter to students, parents and alumni on April 2, outlining Hillel’s response. “We’ve spent the day wrangling with the challenges posed by such an action. While we support the right of every student in our community to express themselves freely, foremost in our response has been defending the safety of our students from this intrusion on their privacy and security,” Cohn said. That response included meeting with university officials and with Emory’s police department, to ensure that Israel Week events were not disturbed. “A university administrator stamped approval and by doing so sanctioned the content of the ‘eviction’ notice. There is no wiggle room for the university’s bad judgment; it was bad judgment. Period. It is clear that the person, persons, or committee that approved the posting did not realize or understand the anti-Semitic contents of the flyer,” Stein said. “Sanctioning the posting of this flyer and issuing a shoddy letter of explanation does not absolve the institution of complicity in making students’ lives anxious, and in fostering a notice with anti-Jewish content. …It is hoped that the university letter is the first response and not its final statement on this matter. In the parlance of Passover, “it is not sufficient.” It is not at all close to dayenu,” Stein said. Sophia Weinstein, president of E-IPAC, told the AJT that Emory College of Arts and Sciences Dean Michael Elliott said that he hoped to set up a meeting between university officials and representatives of several campus Jewish groups. “These articles have said things like, ‘If you’re Jewish and thinking of sending your son or daughter to Emory University, apparently this is the sort of thing your child can look forward to.’ As a proud Jewish Emory student, I feel that it is my responsibility to set the record straight. Emory University has and absolutely still continues to be an ardent supporter of our Jewish community. One organization’s actions do not represent our university. One office within the university’s actions also do not represent our university. What represents our university is the commitment to respect, evidence-based dialogue, and support of all students,” said Cantor, who is chair of Jewish life on the Emory Hillel board. Emory’s handling of the situation also has been criticized outside of the university. Allison Padilla-Goodman, Southeast regional director of the Anti-Defamation League, released a letter sent April 4 to Emory University President Claire E. Sterk. “The anti-Israel activists who passed out these notices are creating tension, intimidating and isolating students, and fostering a hostile atmosphere on campus. The academic environment should be a place where constructive dialogue and discourse about the Israeli-Palestinian conflict can thrive, not a place where perspectives regarding the conflict infringe on students’ personal space, the ADL letter said. Shaked Angel, the Greater Atlanta regional director for the Israeli-American Council, released a letter that he sent to Sterk.